Alabama Logistics | Alabama Staffing Solutions | Warehousing | TeamOne Logistics, LLC. A partnership with TeamOne is an improvement in your company’s recruitment and retention of great employees. 300 combined years of experience makes up our team of recruiters who work to find great employees to add immense value to your business. We are experts in the logistics and transportation industries and understand the qualities an employee should have to help you be successful. The Trucking and Logistics industries face a large array of safety related responsibilities such as OSHA and CSA. That’s why TeamOne Logistics develops a personal relationship with each employee and ensures that they are qualified, safe, and compliant. We manage and are held liable for regulatory compliance, licensing, and employee record-keeping to take the responsibility of a new employee away from your company. 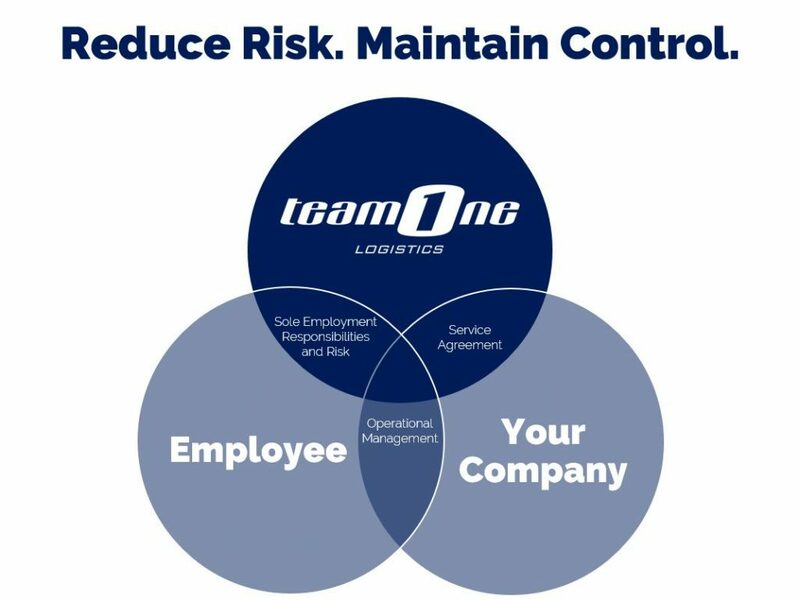 Your company’s risk exposure is minimized through a partnership with TeamOne Logistics as we tailor a specific safety program to meet your specific needs. With the complexity of worker’s compensation laws in the trucking and logistics industries as well as the steady increase in the cost of healthcare, you need a partner who can help you handle these challenges. We are experts in tackling the industry’s most complex problems for our partners. When it comes to worker’s compensation, we eliminate your risk by taking on all worker’s compensation liability with first dollar coverage. Should a worker’s compensation issue arise, you have no deductible. As a part of our efforts to ensure you retain a strong workforce, we provide quality healthcare services for each employee. Our focus on the unique needs of logistics and transportation workers allows us to ensure that employees have the support they need in order to focus less on administrative work and more on their job responsibilities. TeamOne Logistics has a unique business model. What we provide is distinctive. We are a long-term enhanced alternative to the driver staffing/leasing companies the transportation industry has endured for too long. When you need Logistical Services in Alabama, you want to choose TeamOne Logistics. TeamOne Logistics has a unique “employer of record” partnership model which eliminates most liability for the end customer while creating savings and flexibility without loss of operational control. Our integrated workforce solution also leverages logistics recruiters located throughout the U.S. to help fuel growth. We are proud to have provided logistics staffing solutions to businesses in Alabama for many years. Alabama boasts passionate residents who are proud to call great cities such as Birmingham, Huntsville, Mobile and Montgomery home. With a population of just under 5 million residents, we never struggle to match experienced and professional workers with great businesses. We continue to experience great success in Alabama, providing businesses with well-trained local workers and the service of handling all of the legal requirements for workers that Alabama enforces on companies. With a National presence of 800 employees currently operating with clients in 87 locations across 29 states, TeamOne Logistics has all the Alabama Logistics Staffing Solutions that any business could desire. We are not a staffing agency, but a solution to solve all your Alabama logistics staffing needs with expert recruiters and trainers located throughout the US and a combined 300 years of logistics industry experience. With over 300 years of combines industry experience, the recruiters at TeamOne Logistics use proven sourcing strategies along with their history of experience in the market to deliver tangible results to our clients. We help you find your best workers! Providing you, and your staff, with the support you need. Dealing with worker’s compensation for a workforce of any size can be difficult to handle. Here at TeamOne Logistics, we provide the service for you so! In Alabama, there are specific rights that both the employer and employee have when handling worker’s compensation claims. Employers have the right to request that the employee receives a medical examination, take a drug and alcohol test, and direct care through their approved physician. Employees must file their charges immediately in order to enhance their chances of proving the injury occurred on the job. Once all claims have been filed and approved, employees can receive about 66% of what their wages were previously in Alabama. This is all subject to the specific case and employer and is a legal process that TeamOne Logistics can handle for you! Candidates for AL staffing solutions employment can contact TeamOne Logistics at (770) 232-9902 between the hours of 8 A.M. and 5 P.M Eastern Time. Candidates can also contact us by email at careers@teamonelogistics.com.